Jay Leno is my neighbor. He’s not my next-door neighbor, but our small Newport, RI community consists of around 60,000 people. Even though I’ve never met him, I hear he’s an extremely nice guy. That’s why this is a uniquely difficult article to write. I haven’t seen a money/celebrity article this bad since the famous Men’s Health/Erin Burnett article of late 2007. A few days after I pointed it out it started to make headline news. A gated entrance and winding drive leads up to the estate, which sits on a 9-acre lot and features 15,851 square feet of living space. The home has 12 bedrooms, 12 full bathrooms and three half-baths, according to the listing. It’s also packed with luxe amenities, including a carriage house, walled garden and tennis court. There’s more to the description, but a $13.5 million home tells you all you need to know. Using standard estimates on maintenance of a home of 1% of annual price per year, he’ll spend about $135,000 a year just to keep it as it is. Maybe it’s even more with the extensive landscaping. Jay Leno’s “last dime” must be Scrooge McDuck lucky one. Originally, I thought that the online version of May 15, 2018 was before he bought the mansion, but it was after. The Money Magazine article above also mentions that he has around 350 motor vehicles. That includes one he bought in 1999 for $800,000. That’s over 1.2 million in inflation-adjusted dollars today. I found only one thing in the article that led me to believe he’s frugal. Leno says he doesn’t spend much on clothes. Leno does make an attempt to preach good financial habits. He says that he never bought anything before he could afford it, never bought anything on credit, and that cash is king. Unfortunately, these are all things that Paris Hilton could say as soon as she was old enough to talk. While Leno made his fortune himself, it’s doesn’t mean he’s frugal. Those financial habits are very easy to follow… if you have a net worth of $350 million. If a $13.5 million home and a $70 million car collection*, is living frugally then, you too, can be frugal! Jay Leno himself – I actually think that Jay Leno might deserve the least blame. He’s just saying things like they are for him and giving a little background in his past. Jay Leno’s publicist – Shouldn’t his publicist take a look at this and say, “Ummm, Jay, this comes off like an alcoholic claiming he isn’t one because he rarely drinks tequila. Instead he only drinks 2 liters of vodka by noon each day”? Money Magazine – Shouldn’t an editor at Money Magazine take a look at this and say, “We lose a lot of credibility when we blindly equate spending dozens of millions of dollars with being frugal. Only Larry Ellison** can relate when he reads this. The rest of our audience is going to collectively think WTF“? 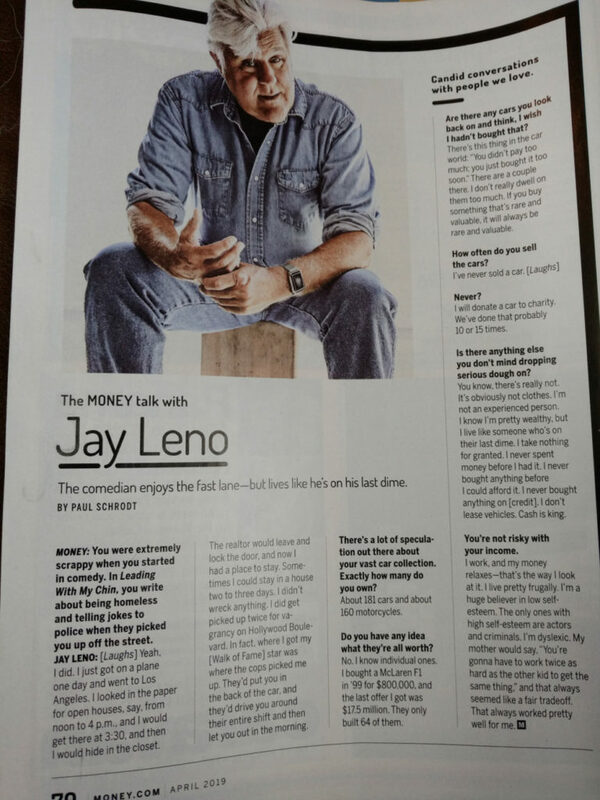 I’m also confused about why Money Magazine would recycle this interview from about a year ago now. I wonder if they ran out of production time and quickly edited something old as filler. I’m going to leave those questions up to you, the reader to answer. Let me know your thoughts in comments. * This is estimated by adding the 50 more cars mentioned in this interview to the $50 million mentioned at that link. ** Larry Ellison is one of my other rich “neighbors”. The Lost Sock Drawer and Books Galore! A few years ago I decided not to throw out any of my orphaned socks that have no matches coming from the laundry. Instead I saved them in the “lost sock drawer.” My thinking was that even if one sock was ripped or torn, it’s partner may find another partner who has experienced a similar fate. Then they can live together (and maybe their partners will meet up in sock heaven). Recently, it became very difficult to close my lost sock drawer. It was time to see if I could match some of them up. 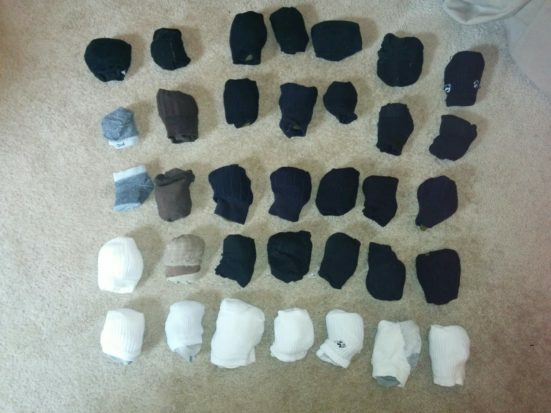 I was surprised how many socks I was able to match up! That’s 35 pairs of socks for those not interested in counting. There were so many socks that I couldn’t put them all in my (found?) sock drawer. I ended up stocking many of them as pairs in the lost sock drawer. I hope they don’t have hurt feelings, but I was able to give them the remaining 23 orphaned socks as friends. It might be a very long before I need to buy more socks. Our family went to a church fundraiser this past weekend. I don’t really fit in at an English tea, but the wife liked the idea. We weren’t sure if the 2 and 3 year old were going to behave for it, but there was only one way to find out. When we got there, we were surprised to find that they had a children’s English tea that was Harry Potter themed. We changed plans and bought tickets for our kids. They did a terrific job with exception attention to detail. I think it helped that the teenagers volunteering to help run it were enthusiastic about being Harry Potter characters. It was a great time and they had other things such as a petting zoo for the kids too. As we were leaving, we noticed a book tent. It was mostly books, but there were also a lot of CDs and DVDs. I wasn’t too interested in the books… I have a few dozen on my shelf that I want to read that I will probably never get to. I thought about the DVDs, but they seemed to be either movies that I had seen or ones that I didn’t have big interest in seeing. One of the exceptions was Rent. I figured it was probably worth a couple of dollars even though I’ve seen it a couple of times. It was the end of the day. They didn’t want to haul all the books away. Instead they decided they’d sell a bag for 5 dollars and let people fill it with whatever they wanted in the tent. We jumped on the opportunity. My wife and I must have come away with 20 books (and the Rent DVD). We even got the SpongeBob SquarePants Movie Soundtrack for the kids. Yes, it’s a movie they haven’t seen, but maybe some day they will and we’ll be happy to have the DVD. My books tended to be personal finance books and self-improvement books (fodder for Be Better Now). My wife’s books tended to be fiction books (typically ones that have been made into movies). The lesson: While showing up early gives you the best picks of the litter, you can often score some big deals at the close as well. I’ve found that this works well for yard sales and farmer’s markets. Cabin fever is the worst, especially for romantics out there. Sure, bundling up by a roaring fireplace can be a nice treat, but what happens when that’s all you have or you can’t afford to do much else? Luckily for you, the season presents a ton of amazing free or super inexpensive date ideas just about everyone will love. One of the worst parts of winter could become one of your favorite parts! With the sun going down so early, grab a blanket, find a spot on a hill, and invite your date to enjoy the sights. Bring hot tea or cocoa to up the romance. In the winter, when kids are back in school, museums often feature free days or hours aimed at getting people in during the slow months. Take a day off and hit the exhibits before it becomes overpriced or too crowded to enjoy. If you love anything old, take to flea markets, bazaars, and shops to learn about America’s history. You don’t have to buy anything, but bring along a smartphone or WIFI enabled tablet so you can look up the maker or see the real value of that vintage tea seat or painting. Have a little fun by going back in time to your childhood. Sledding isn’t just for kids! Grab a plastic saucer, a pool inner tube, a tray from a cafeteria (shhh…), or borrow a real sled and go crazy! It’s a winter amusement park waiting to happen. When winter comes, smaller communities love to offer introductory classes. These may be in fitness, art, cooking, etc. Scan your Facebook page, local newspaper, or event website to see what’s going on in your area for free. Love to read? Bring your date to the library and challenge them to pick out three books for you (and do the same for them). Then grab a table and have them tell you why you should read it. It may sound cheesey, but it’s a great way to open up and get some awesome reading recommendations too. Don’t bring the grill inside! Inside, turn up a fireplace or stand by a burner and create s’mores, hot dogs, or popcorn. Then snuggle up to a camping or outdoor movie to complete the feel. It’s a tasty treat that doesn’t require much in supplies or even too much creativity, but it’s always a fun change up on routines. Once college is back in session, schools start packing their schedule with presenters and lecturers from all over the country. And most are free and open to the public! Try a music rehearsal with a famous conductor, sit in on a talk on human psychology with a famed author, or even learn about a new social issue from a visiting politician. You’ll leave with so much to talk about! Bar trivia is a winter favorite of frugal people everywhere. It often only requires the purchase of one drink (stick with soda) to play, and you’ll love the competitiveness of it. Plus, who doesn’t want the chance to win gift cards, money, or other great prizes just by answering a few random questions correctly? This one is always a win for nerds and know-it-alls! If you live in a major city like New York or LA, you’re in luck! Shows filmed in your area are always looking for live audiences to fill their seats and provide laughter or even contestants. Luckily for us, all of that is free! You just need to reserve your spots online or over the phone and read the rules very carefully. Lately, I’ve been reading some personal finance gurus who are against the frugal mindset. I understand their point. On one hand, life is too short to not enjoy it. It’s easy to sell a “just earn more money” message. It also makes it easy to follow it up with, “Buy my book or buy my course.” To put it simply, by its very definition, it is hard to sell training to frugal people. There’s a place for focusing on earning more. I had some kind of moment last September where I said, “Hey I can earn more.” I hustled to get my dog sitting profile up and work on this site. So far the results have been great. But there’s the other side of the coin as well. Frugality matters. I’ve always enjoyed reading about financial freedom and what people are doing to get there. Two of my favorite reads of late are Retire By 40 and Root of Good. They are extremely intelligent people who are focused on early retirement. Neither of them are attempting to do it by going out and earning more money. They’ve saved a lot of money throughout the years. More importantly, they have learned to make simple substitutions to save a lot of money while not compromising their happiness. Here’s one example that most of us can relate to. Let’s say you have a $60 cable bill. A frugal-minded person might say, “Netflix has more television than I could ever watch at $10 a month.” I’m going to cut my cable bill and save $50 a month. That $50 a month is $600 a year. This is where we need to apply the Rule of 25. The rule of 25 states that in order to afford a $600 annual expense, you need to have 25 times more saved. It’s mathematically derived from a bunch of economic analysis that shows people can live on 4% of their saving mostly indefinitely by investing a large sum of money. At the risk of putting an example in an example, if you have $1,000,000 you can roughly take out $40,000 to live on. And with the rule of 25, if you need $40,000 to live on, you should have a million in savings. When we translate that to our $600 annual cable bill, we need to have $15,000 in our savings just for that. That’s just one bill. You multiply it by a lot of extravagances and you are going to have a hundreds of thousands of dollars in your savings. A little frugality can make a big difference in financial freedom. I’m not saying that you shouldn’t try to make more money. I’m simply saying you should be aware that frugality can being you to financial freedom early enough that you’ll have plenty of years to enjoy it. The following is guest post by Connor Gray. He is known by his friends and family as Mr Frugal. He loves saving money, and helping others do the same, and writes for a variety of lifestyle and personal finance sites sharing his tips and tricks. Being frugal is a great way to live. You will find that there are many ways you can save money while still enjoying yourself, providing you with a sense of satisfaction and a realization that you can make big savings when you want to. However, there are a number of mistakes that you can end up making when you want to be more frugal, and here are six to avoid. When you start living a frugal lifestyle, you will want to spend less when you go to the shops. But while it makes perfect sense to spend less on cheaper products that are not particularly important, such as a cheaper brand of cereal, there are some times when you really should be spending more. You’ve probably heard the phrase: “Pay peanuts, get monkeys.” Keep this in mind when you make an important purchase. When you buy a new dishwasher or vacuum cleaner, this is something that you want to last. Quality products last longer. They cost more, but in the long term you save money because you spend less on fixing and replacing them, so know when to spend more to save more. Look after what you have and get the very most out of your existing possessions. Sometimes there are simple ways to protect what you own. They involve spending more at the outset, but they can save you more in the long run. For example, take the car seat protectors from Shear Comfort. Buying them involves a cost, but you can protect your car seats and keep them in good condition. Then when you come to selling your car, this could help you to get a better price for it. Sometimes you really do have to spend money to save money, and the trick is knowing where to spend your money. Don’t make the mistake of assuming that just because things are cheap, you can buy more of them. You may see a great deal on food at the supermarket, and it’s so cheap that you end up buying it because it’s cheap rather than because you need it. But you’ll either eat something you don’t need, or end up throwing it away. So always ask yourself whether you really need something before you buy it. DIY can be a great way to save some money. Doing things yourself rather than hiring someone to do the job for you is very sensible. But there are times when it makes more financial sense to pay for professional services. Know your abilities because DIY mistakes can be very costly. If you don’t have the skills, don’t attempt to fix everything yourself. You could end up causing more damage, and then you’ll have to pay for a professional as well as paying extra to fix the damage. Coupons can be very attractive, but many people make mistakes when it comes to using them. There is often a need to use the coupon even if you don’t really need the product on offer. You may think that it is an offer too good to refuse, but remember that you will usually be spending money. Again, ask yourself whether you really need the product in the first place. The most common mistake of all is being so frugal that you forget to enjoy yourself. Being frugal is great, and it can be very satisfying. But that does not mean you should stop enjoying life. Treat yourself and your family, know when to spend slightly more on a special event or day out, and don’t miss out on all the fun things in life that involve spending a bit more money. These are all some of the most common mistakes that you can make when attempting to live a more frugal existence. Avoid these and you will spend less and get more enjoyment from your new frugal lifestyle.